Brazil Backpacking Guide 2018 - Adventure, Party, Budget, Stay Safe! An Introduction to Backpacking Brazil! When is the best time of year to travel to Brazil? The best places to visit in Brazil? Is it safe to go backpacking in Brazil? What to pack for a backpacking trip to Brazil? Which backpack should I take to Brazil? Is there malaria in Brazil? And finally… Some Portugese Slang to help you sound like a Brazilian! EAT! Feijoada. Brazil’s national dish is a thick stew made with black beans, pork ‘bits’ and beef. Served with rice, collard greens and sliced oranges – usually available in restaurants on Wednesdays and Saturdays. Just don’t overload on this… it’s a heavy one! BEWARE! Political protests. There have been large protests across 11 cities in Brazil recently and police have used riot control methods such as tear gas to disperse protestors. Tourists should avoid demonstrations at all times as you never know when these can turn violent. WEAR! Fancy Dress Costume at The Rio Carnival. The biggest festival in the world, “Carnival“, takes place every year in Brazil’s vibrant capital city, Rio de Janeiro. The festival takes place during the month of March as the streets flood with people from dusk until dawn. Dress in your most elaborate outfit possible and don’t miss the main Samba Parade. For those who are really into it – you can pre-order your costume for the event on the official Rio Carnival Page! SPEAK! Portuguese. The only country in South America where Portuguese is the official language dating back to the colonisation of Brazil by the Portuguese in the 16th century. English is not widely spoken so brush up on your Portuguese before you leave! Often thought of as a separate part of South America entirely, Brazil is by far the largest country on the continent covering over 47% of the land mass. It’s so big that it covers three time zones! For sheer size reasons, Brazil can be a trip entirely on its own, but with a different language, culture and feel to the rest of South America, it can seem like you are in a different continent altogether! The name ‘Brazil’ comes from the Brazilwood tree (pau Brazil) – which was the first export to come from the country. Today, Brazil has the largest economy in South America and one of the largest in the world – and growing! From its passionate, fiery cities to one of the natural wonders of the world, the incredible Amazon Rainforest, to the white sandy beaches of Ipanema and the cascading waterfalls of Iguazu… This country is huge in terms of size, diversity and opportunity for adventure. Here, in our ultimate guide to backpacking in Brazil, we cover everything! From the best time of year to travel to staying safe, the most incredible bucket list experiences that are not to be missed, how to get around, which vaccinations you’ll need, what to eat and more. So if you’re wondering whether to add a backpacking trip to Brazil to your bucket list, the answer is a firm YES! Surfers on the beach in Itacaré, Brazil. Brazil is an incredible country to visit any time of the year. So we’ve split this out into categories, to help you decide when to plan your Brazilian backpacking adventure! As is the case with such a large country, the weather can vary greatly across Brazil, so there’s no real bad time of year to visit the country. Winter (May to September): Winter in Brazil runs from May to September, and conditions vary across the country. In the north of the country, you can expect balmy temperatures of 20 to 30 degrees during the day, with cooler evenings. Whilst in Rio, temperatures are slightly cooler at an average of 14 to 25 degrees during the daytime. You will get some rainy days, but also plenty of crisp blue-sky days without a cloud in sight. Heading South past São Paulo, the Brazilian Winter feels much colder! Expect low temperatures (sometimes even reaching negative figures) and perhaps a little snowfall if you’re at a higher altitude. If you want to go trekking in Brazil and get incredible far-reaching views, then winter is the perfect time to travel. Summer (November to March): Summer runs between November and March, with temperatures reaching highs of up to 50 degrees, especially in Rio de Janeiro. Extreme temperatures and Brazil’s tropical climate often lead to extreme weather, with heavy rain (but don’t be put off, these storms don’t last long). High humidity levels should be expected throughout the Brazilian summer, so keep your hydration levels up. Although if you’re heading North and into the Amazon, be prepared for rainy season between March and May! There are two major events in the Brazilian calendar – New Year’s Eve (31st December) and Carnival (held just before Lent, usually taking place in late February or early March). New Year’s Eve is celebrated throughout the World, but in Brazil, there’s no better place to be than in Rio de Janeiro, stood on Copacabana beach! Often called ‘the biggest party in the World’, join people from all over the world all dressed in white (as a sign to welcome the New Year and encourage peace and prosperity in the months to come). On the beach, you can buy handmade paper boats, loaded up with offerings to the Goddess of the Water, Lemanja, in the hope that she will bring prosperity for the year ahead. The 4km stretch of sandy beach is undoubtedly the city’s most popular spot from which to stand and watch a spectacular firework display. Two months later, just before Lent, the city of Rio de Janeiro comes alive once again as they celebrate Carnival! Street parties take over the city for a week of colourful and flamboyant celebrations – expect extravagant floats, spectacular costumes, and dance moves that you’ll find hard (or embarrassing) to repeat. Every neighbourhood has its own distinct celebrations, and you can easily spend a week wandering around, soaking up the atmosphere and getting involved in the biggest Carnival you’ll probably ever attend. Carnival in Rio will be one of your most unforgettable Brazil experiences! Avoid peak season in Brazil and you’ll get some amazing deals on hostels, travel and experiences. As with most countries, you’ll find that the cities are more expensive (Rio De Janeiro topping the list and for good reason), while your money will go further in the smaller cities and towns. If you visit during one of the countries celebrations such as New Year or Carnival, then expect your backpacker budget to be blown! Book far in advance (especially your accommodation) to soften the blow. Winter is the cheapest time of year to go backpacking in Brazil. Unfortunately, Brazil is the most expensive country to backpack in South America. If you’re used to the cheap beds and almuerzos of Colombia and Bolivia, you’re in for a shock here in Brazil where prices in the major cities resemble European cities. However, it is totally possible to backpack Brazil on a budget. For more info, check out our article on 10 money-saving tips for Brazil! Across Brazil, you’ll find towering cities, dense rainforest, white sandy beaches… it really is a country of contrasts! So there are plenty of places to visit during your trip to Brazil. The largest rainforest on earth, home to the world’s largest river system, the incredible Amazon Rainforest spreads across half of Brazil and extends to Peru, Bolivia, Venezuela and Colombia. It’s difficult to comprehend just how large this area is, covering 1.4 billion acres (or 5.5 million km squared)! Just the name conjures up images of adventure, long lost tribes, dense forest and incredible wildlife. Taking canoe rides upstream through dense forest, meeting people’s whose livelihoods have depended on the awesome river for thousands of years and waking up to the sound of tropical birds and unknown creatures… these are the memories of the Amazon that you will take home with you. Brazil’s two largest cities, Rio de Janeiro and São Paulo, are located in the south-east of the country. Cosmopolitan, wild, artistic, cultured, electric, fashionable, noisy, diverse – it’s difficult to sum up Brazil’s city life in one word. Rio de Janeiro (also known as the Cidade Marvillhosa – or marvellous city) is recognised worldwide for its iconic landmarks – the Christ the Redeemer Statue of Corcovado Mountain and the unmissable Sugar Loaf Mountain. Those who have never even dreamed of going to Brazil have surely heard of the famous beaches of Copacabana and Ipanema – and heard rumours about the uncontrollable fever of Carnaval. Situated in this idyllic setting with mountains, white sandy beaches and rocky islands surrounding the city – there is much to do in Brazil’s capital aside from soak up the intoxicating street life. With art galleries, restaurants and heady nightlife, visitors to Rio are in for one hell of a treat! And when Rio gets too much, there are plenty of great escapes just a short journey away. From the colonial vibes and architecture of Paraty, to kite surfing and partying in Buzios, or the unspoilt beaches and dense jungle of Ihla Grande. Check out our Top 10 Escapes from Rio De Janeiro. Rio De Janeiro in the mist – surely the best setting for a city in the world? On the other hand, São Paulo is actually Brazil’s largest city and economic and business centre. Renowned for its style, music, intense nightlife and unmistakeable joie de vivre, this city is often overlooked by tourists who favour the more celebrated capital. Big mistake! Visitors to this city will discover a cosmopolitan, multicultural city with a big personality, home to many different types of people (large communities of Japanese, Italians, Jewish and Arab call live here). In the northeast of the country, you will discover untouched beautiful coastline interspersed with colonial cities such as Recife, Olinda and Fortaleza. Those who dig deeper will be rewarded; you will find oceanic wildlife reserves (The Ilha de Fernando de Noronha) and incredible national parks (such as Piaui). Head to Maranhão for an interesting mix of cultures – from Europeans to Indians or to Matto Grosso to explore the amazing Pantanal swamp. What’s so bad about South America that even the Brazilian men at the local Jiu-Jitsu gym advised me against visiting their home country? Brazil is actually ranked 81st out of 162 on the ranking of the safest and most dangerous countries (according to safearound.com). But it’s the high level of inequality that seems to prompt the high levels of crime. Statistics show that the most common crimes are pickpocketing, mugging and scams. So by not flaunting your valuables or carrying around or wads of cash, you can reduce your likelihood of becoming a crime statistic. 1. Be sensible – As with all travelling, you need to have our wits about us and use common sense in order to keep safe. Don’t go in areas that you have been warned against and don’t flaunt cash or your belongings. 2. Leave valuables at home – Yes – that means that you may have to be parted from your beloved laptops and iPhones for a while! 3. Leave jewellery at home – Travellers are advised to not wear any piece of jewellery whilst in Brazil, be it a watch or a necklace, even if it is inexpensive. (That means costume jewellery from Primark!) If it glitters, you may be making yourself an unnecessary target! 4. Don’t carry around too much cash – Be careful at ATM machines. Don’t take out too much money all at once and certainly don’t let people seeing you do this. It is wise to have a small amount of cash on you, so in the case that you do get mugged, you can hand over everything that you have – at minimal loss to you. 5. Don’t flaunt your stuff – Hanging an expensive DSLR camera from your neck is a big no-no! 6. Don’t fight back – If you are targeted, there’s nothing more valuable than your life, so hand over your valuables calmly and without resistance. 7. Seek advice from your guesthouse/hostel – Seeking advice from locals can also be invaluable no matter what country you’re in, so be sure to ask your hosts (whether that’s at a hostel or airbnb) which areas they would advise that you steer clear from. 8. Avoid Favela Tours – As tempting as it may seem, avoid a guided ‘favela tour’… favelas are notoriously unstable and not really a place to be wandering around. 9. Learn Portuguese – Learning a little of the local language can help you to fit in and make you seem like you’ve been in Brazil longer than just a few days (check out our Brazilian slang below!). 10. Dress to blend in – It’s also a good idea to try and emulate the dress of the locals, rather than dressing like a ‘socks-and-sandals’ tourist stereotype! The longer you look like you’ve been in Brazil, the less of a target you will be. 11. Adopt ‘the walk’ – My friend always says that when she’s feeling unsafe in a city she adopts ‘the walk’, which means that she starts to walk with purpose, attitude and confidence, that makes her look like she’s walked that route a million times. I’m not saying you have to practise your own special walk before you go to Brazil, but looking frightened, fumbling with a paper map or walking with your eyes glued to Google Maps your phone, will make you look like you’re a lost newbie in the city. 12. Get Travel Insurance – A must for travelling to Brazil! Packing. The culmination of all your counting down, route planning, hostel booking, blog reading, and money saving. So what are the essentials that you should pack for a trip to Brazil? A worldwide adapter plug, with USB ports: electrical equipment is heavy and will take up precious backpack space. Before you depart, treat yourself to a worldwide adapter plug like this one that has USB ports built in. Never again will you have to fight over the only socket in the café / hostel room! Sun cream: with most beauty products (shampoo, shower gel, toothpaste etc.) you can buy them when you’re travelling to save room and weight. But sun cream is a budget-buster abroad, and the SPF isn’t always as reliable as those tried and trusted products from home. Packing a bottle of high SPF waterproof sun cream is a worthwhile use of backpack space! A micro fibre towel: technologies are evolving and micro fibre towels like these ones are better than ever. They’re light and fluffy, take up a fraction of the space in your backpack, and dry in literally no time at all. Perfect for trekking, showering, and can even double up as a blanket for those chilly nights. Mini first aid/sewing kit: it’s amazing how often you’ll find yourself needing scissors when you don’t have them. Pack a mini first aid and sewing kit that covers the basics: antiseptic wipes, spray-on plaster (stays in place much longer than a stick on one! ), a small bandage, mini scissors and a needle and thread. A reusable filtered water bottle: with the increased focus on cutting down our use of plastic, a reusable water bottle is a must for your travels. If you’ve got the cash, invest in a water purifying bottle such as the Life Straw, or purchase some water purification tablets for when you’re unsure about the quality of the water! These are a life-saver (literally) when hiking. Rehydration tablets: strange and foreign foods pose a risk of upset stomachs and there’s nothing worse than a dodgy tummy on the road. Travel with anti-diarrhoea tablets such as Imodium, and also some rehydration sachets or tablets to dissolve in your water. You’ll spend a lot less time on the loo and feel better in no time! Plastic zip lock bags: if there’s a risk of rain, pack some small zip lock plastic bags. You can use these to protect electrical equipment such as headphones or chargers, to organise small things such as medicine or jewellery, or just to store wet swimwear. They take zero room and have a million uses! A light-weight sarong or pashmina: for girls, a thin fabric shawl is invaluable. It can act as a beach towel, skirt, scarf, cover-up, blanket, sling… the list goes on! Now that we’ve covered the packing essentials, it’s time to think about your luggage. Are you going wheelie suitcase (don’t do it! ), 75l backpack, or hand luggage only? 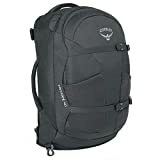 Our top backpacker approved backpack is the Osprey Farpoint 40. It’s front opening, hard wearing, super practical and water resistant. What more could you want? Within your backpack of choice, what should all these life-saving, fun-enhancing, travel essentials be packed into? Packing cubes, the new essential on every backpacker packing list. Long gone are the days when you have to pull every item out of your backpack in order to find that elusive t-shirt or clean pair of pants. Packing cubes mean that all your items are stashed away in organised pouches, making it way easier to find things and pack your bag. We would also wholeheartedly recommend a front-opening backpack. These bags have made the life of a weary backpacker 100 times easier. Invest in one of our backpacker tried and tested backpacks, or grab yourself a second hand one on eBay and save your money for extra helpings of steak and red wine. There’s one last thing that we would recommend you pack… your passport! Speaking of passports, it’s important to check whether you will need a visa to enter your planned country. Most nationalities don’t need a visa for a visit to Brazil, British nationals, for example, can enter the country as a tourist with no visa requirement. We always recommend ensuring you have a minimum of four blank passport pages, it’s valid for over six months, and that you have proof of onward travel (read more about proof of onward travel here). All travellers are recommended to get the MMR vaccination, which is given as a course of two injections. All travellers are recommended to get the DTaP vaccination, which is given as a single dose. Most travellers are recommended to get the Typhoid vaccination, which is given as a single dose. Most travellers are recommended to get the Hep A vaccination, which is given as a single dose. Risk of contracting Hepatitis A is through contaminated food and water. Some travellers are recommended to get the Hep B vaccination, which is given as course of three doses. Risk of contracting Hepatitis B is through bodily fluids, or medical intervention. ALL travellers are recommended to get the Yellow Fever vaccination, which is given as a single dose. In fact, in some cases, you may not be allowed to enter Brazil without your yellow certificate! Yellow fever can be contracted through mosquitoes. Some travellers are recommended to get the Rabies vaccination, which is given as a course of three. Risk of contracting Rabies comes from infected animals, most commonly monkeys or dogs. The north of Brazil has a high risk of Malaria (especially throughout the Amazon Basin and the city of Manaus). Doctors recommend that you take malaria tablets if you are travelling here. The risk in other parts of the country (including Iguazu Falls) is low to no-risk, so antimalarials are not required.